Bao Pu, son of Bao Tong, has the diaries of the man considered the architect of the massacre, former Prime Minister Li Peng. They included what he wrote in 1989 and were ready for publication in 2004, but the government censored them. A Chinese newspaper publishes a cartoon about the massacre for the first time. Hong Kong (AsiaNews) – Former Chinese Prime Minister Li Peng said he was prepared to die to prevent the 1989 student pro-democracy protests from getting out of hand; for him, the turmoil they caused was comparable to that of the Cultural Revolution, this according to his diaries. Dubbed the “butcher of tiananmen”, Peng was Deng Xiaoping’s strongman and headed the diehard conservative faction in the Communist Party during the crisis. His diaries are now in the hands of Bao Pu, who is an editor and son of Bao Tong, personal secretary and friend to the late Zhao Ziyang, Communist Party secretary who in 1989 tried to prevent the massacre. Li Peng is considered the mastermind and architect of the massacre. According to the book, he backed violent repression in 1989 because the student movement had gotten out of hand, and could cause “a tragedy like the Cultural Revolution”. For the South China Morning Post, which obtained a copy of the text, the publishers are waiting a month in order to establish its authenticity. Li Peng, 81, is thought to be in bad health at present. In his diaries, he describes the debate within the leadership of the Chinese Communist Party from the start of the student demonstrations in April 1989, stressing how the decision to impose martial law and send in the army to clear Tiananmen Square was made by Deng Xiaoping. In their annual letter to the government and the world, the ‘Tiananmen Mothers’, the victims’ parents association, are still wondering why Li Peng has not been taken to task for the event, asking whether he is above the law or not. Something appears to be changing though. Despite Beijing’s strict censorship on the Tiananmen affair, the Southern Metropolitan Daily in Guangzhou published a cartoon showing a boy drawing a line of tanks on a blackboard with what looked like a soldier standing in front. 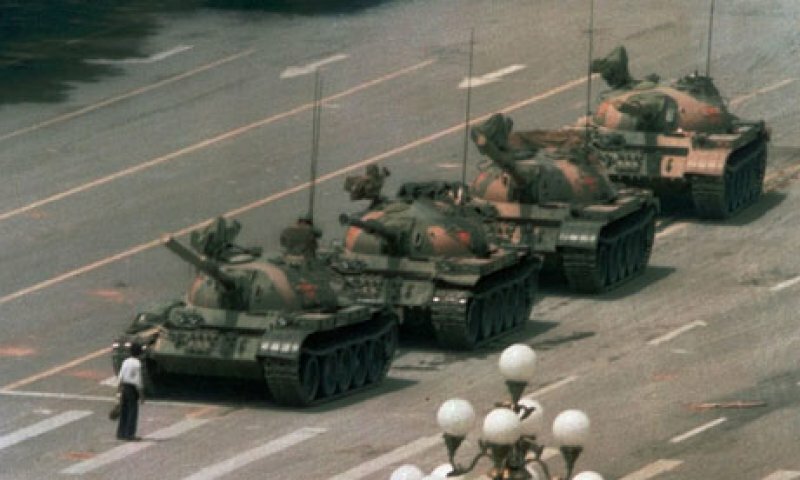 This is a clear reference to the “man with the bag”, the unknown man who for a few minutes stood up to the tanks sent in by the government to squash the demonstrations.